A vicious attack on a bus within the Capital Coach Line has left the 12-year-old company with up to $300,000 in damages. The attack took place on Monday, February 2, 2015 when an unidentified group of people attacked the Mercedes passenger bus that was in Petit-Goâve completing a run with four passengers on board. 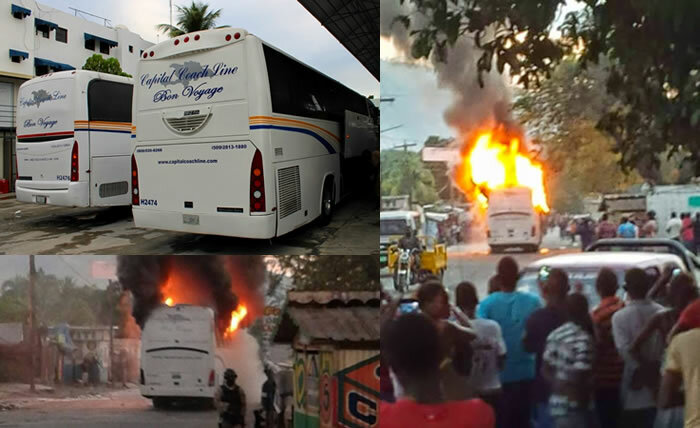 The bus was intercepted in the 5:00 pm daylight, the driver robbed, and the bus burned at the Andrédicette crossroad on National Road #2. Police have weighed in that the attack could have been brought on by the fact that the bus driver was a Dominican Republic national who has worked in Haiti for the last year. It doesn't take a big stretch of the imagination, what with the recent killing of Haitian nationals in the Dominican Republic and the burning of the Haitian flag there, that this could have been the motive. However, the company itself is not convinced that this is so. Since their founding in 2003 as the first bus company in the country, the Capital Coach Line, S.A. has built a significant name for itself offering a twice daily route between destinations like Port-au-Prince and Les Cayes, not to mention being the industry leader. Representatives of the company believe the attack wasn't on the driver, but on them, orchestrated by one of their many competitors. The incident not only cost the company money, but endangered the lives of the four passengers on board, as well as the driver, all of whom had to be rescued by the police from the burning vehicle.